Ground Beef is made from meat cut from the Chuck, Brisket, Flank, Shank and Short Plate primal cuts. The meat is pushed through a meat grinder to produce finely chopped meat. Ground Beef is classified as Grade A or B, with A being the leanest. The term 'ground beef' refers to meat that can contain up to 30%% fat. Ground Beef is used to make Burgers, Meat Loaf, Tacos, Shepherd's Pie, Lasagne, Chili, and other popular dishes. It is a widely used meat in Middle Eastern dishes, such as Koftas, Kebabs, or included in soups or stews. It is also more economical to use in food than other types of meat dishes. Flavors: Flavors can vary based on how it's seasoned. It's best to buy some cuts of beef chuck and grind the meat at home to get better quality meat. At the store, choose a package that is not torn and feels cold. If possible, enclose it in a plastic bag so leaking juices won't drip on other foods. Make ground beef one of the last items to go into your shopping cart. Separate raw meat from ready-cooked items in your cart. Have the clerk bag raw meat, poultry, and fish separately from other items. Buying: All markets carry ground beef in America. It is a pretty common meat that people buy to make many types of dishes, especially hamburgers. Procuring: Generally, ground beef is made from the less tender and less popular cuts of beef. Trimmings from more tender cuts may also be used. Grinding tenderizes the meat and the fat reduces its dryness and improves flavor. Cooks really fast and is very versatile. 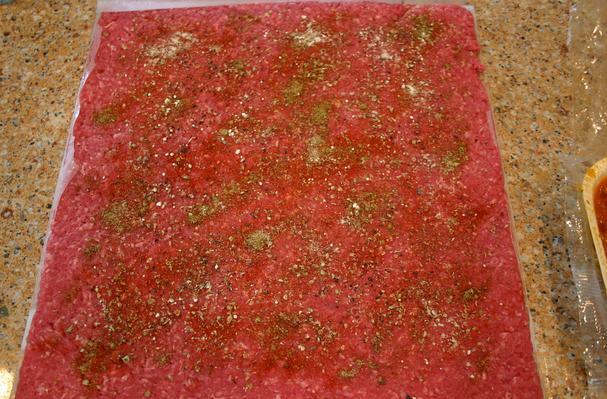 The best way to safely thaw ground beef is in the refrigerator. Keeping meat cold while it is defrosting is essential to prevent growth of bacteria. Cook or refreeze within 1 or 2 days. Cleaning: Can't really clean once you get it from the store. You just have to make sure you cook thoroughly to get rid of all the bacteria. Can store up to 6 months in the freezer. Refrigerate or freeze ground beef as soon as possible after purchase. This preserves freshness and slows growth of bacteria. It can be refrigerated or frozen in its original packaging if the meat will be used soon. If refrigerated, keep at 40 °F or below and use within 1 or 2 days. History: It has long been used in savory meat pies dating back to ancient times. Beef tartare, consisting of finely chopped raw steak or high-quality beef mixed with various herbs and spices, dates back to Russian medieval times.